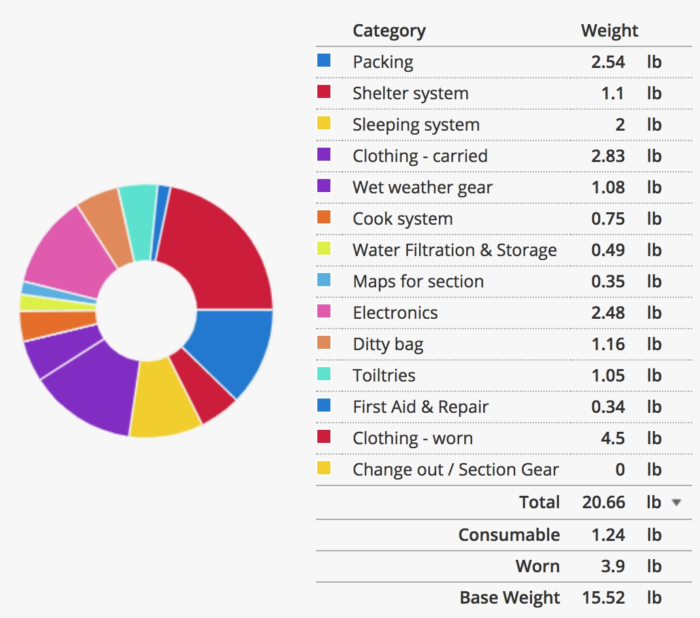 We have all seen the YouTube videos and all scrutinized countless gear lists. You all know how this works. Let’s add one more to the pile and get straight into to it. 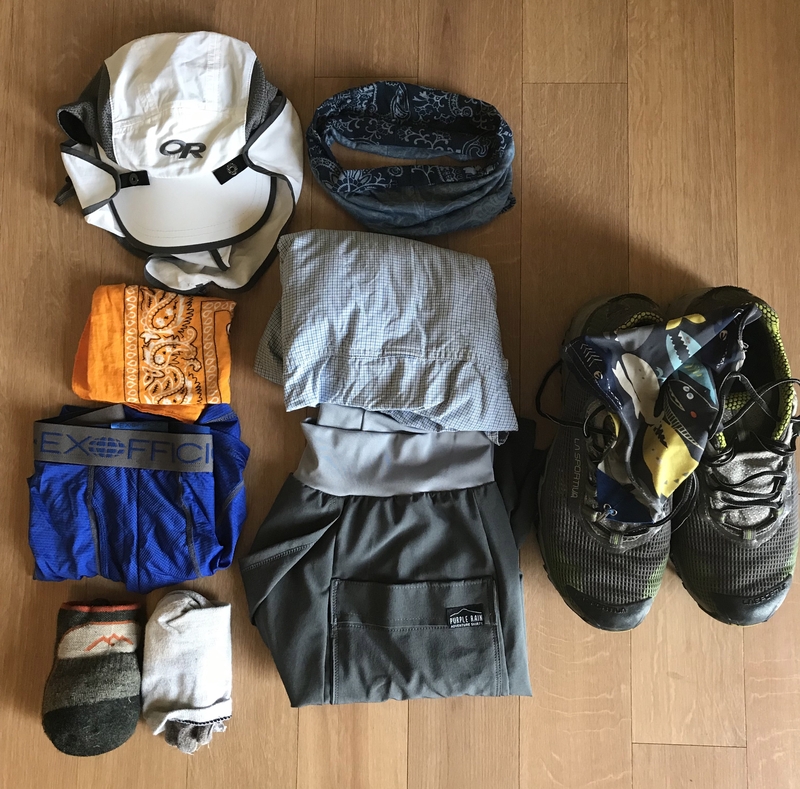 Here is my list for the PCT in 2018 and a few notes on the items I’ll be carrying. 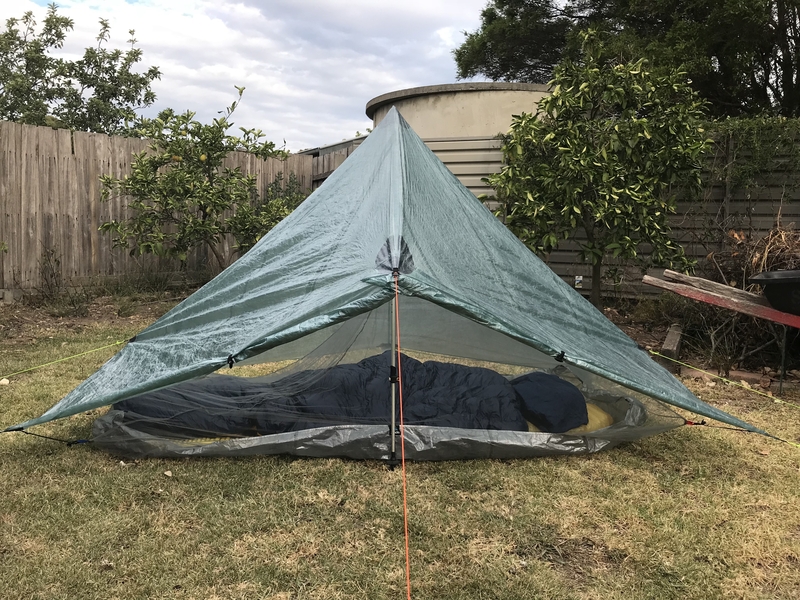 More on the lightweight side than ultralight but realistic for me. My list keeps changing as I take stuff out or swap items. Check out my current list at lighterpack.com. No brain, just the pack. I love the airflow at the back. Stretchy mesh back pocket provides loads of room for gear needed through the day. Easy side access to bottles. I added a Zpacks shoulder pouch for my phone and added a couple of cord lock straps to secure my sun umbrella for hands free operations. Trash compactor bag as a liner. I added Zpacks’ Cuban Fiber bathtub floor and paired the tarp with a modified Sea to Summit Nano bug net. Modifications allow the netting to attach the bathtub floor to the tarp through the mesh. It’s a very flexible setup. I can use bathtub floor for cowboy camping and removable bug net when required or set up the whole thing. I could lose a bit of weight here, particularly with removal of town clothes. Everyone has a Mountain Hardwear Ghost Whisperer, right? I used this on Te Araroa and loved it. It’s coming with me again. My first time using Frogg Toggs. Talk about value for money. Interested to see how it fares. I have a Marmot Precip in a bounce box, which I’ll likely change for Washington. Rain kilt because I hate walking in sweaty rain pants and I don’t care if my legs get wet. I’ll be starting with the Euroschirm umbrella for sun protection in the desert and will see how it goes for rain protection as well. It may get bounced or sent home after SoCal. I will be cooking and I do not get out of bed without a coffee. I don’t get the cold-soak thing. Sawyer Squeeze will be bagged up in ziplock and slept with to prevent freezing. I could definitely lose some weight here. Starting out with an 11,000 mAH battery pack and will assess usage. 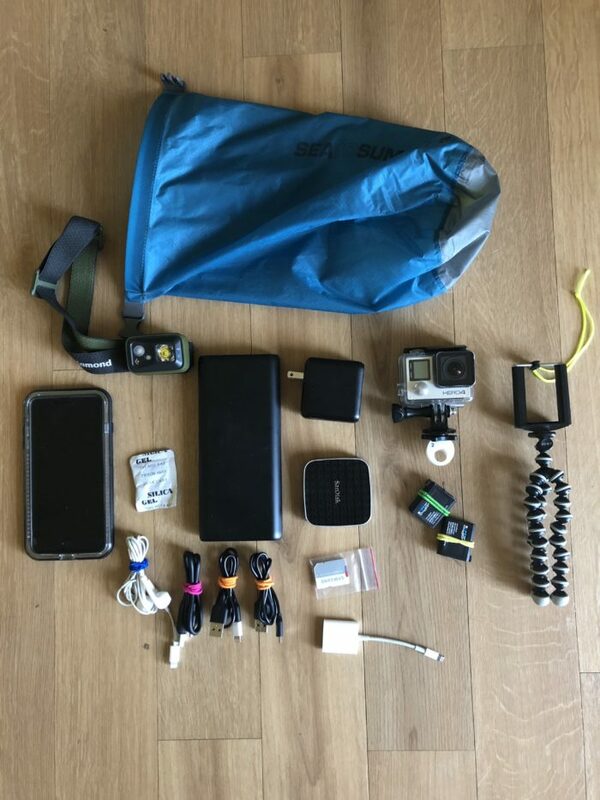 I need a lot of power out there – I take a lot of photos on my phone, blog, record video on my GoPro, use my phone for mapping apps, etc. Also carrying a Wi-Fi SD card reader to transfer photos and video off my phone to free up storage space. Thought about leaving the GoPro at home but couldn’t do it. Purple Rain Adventure Skirt/Kilt. Feel free to judge, I don’t care. I couldn’t think of a more flexible piece of clothing for men or women. Apart from the social stigma I can’t think of many other reasons more fellas are not rocking skirts. Great airflow. They convert to shorts for when you are in town. If you’re cold, throw on a pair of wind pants or leggings underneath without having to strip right down in public. Girls, gives you way more privacy and you don’t have to bare your arse to the world when going to the toilet. I’ve been working with Mandy to produce a little elastic attachment that extends the range of leg motion when converted to shorts mode, allowing you to keep the skirt in shorts mode most of the time if you want (including while hiking), while retaining the flexibility of the skirt. Watch this space. Going for the double sock – Injinji toe sock liner with Darn Tough outer sock. I’m fair-skinned and the sun doesn’t like me so definitely going with a long-sleeve Exofficio shirt and Outdoor Research Sun Runner cap with the detachable neck flap. My LaSportiva Wildcat have a bit of life left in them and they will start the trail with me. I expect to get around 500 miles out of them and will then look to replace with another model. Funny name, serious product. Love my Dirty Girl Gaiters to keep all that sand and junk out of my shoes. –Sierra: Obviously requires a bear can; light base layers will be swapped for heavier items. 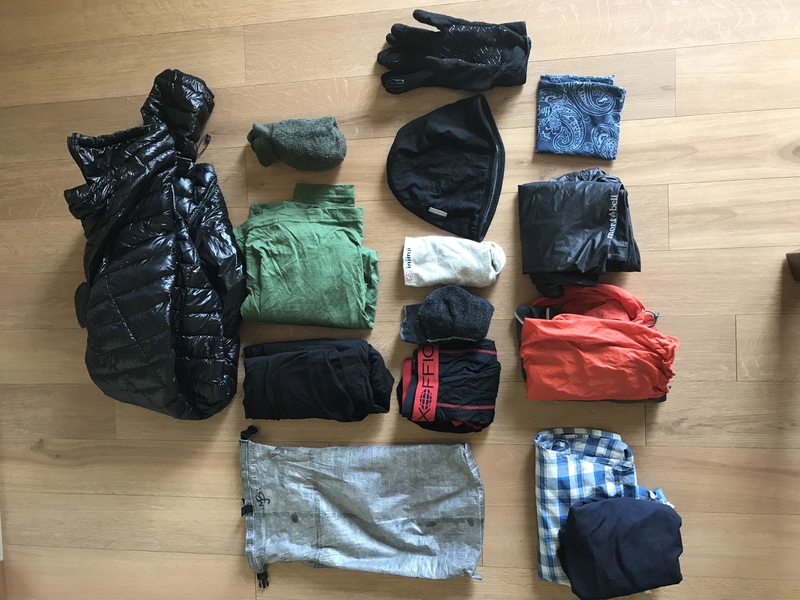 –Washington: The Frogg Toggs will probably go and be replaced by the Marmot Precip jacket; and rain skirt swapped for rain pants; assess if skirt/leggings will cut it for warmth or if need to swap out for conventional pants. –No ice axe. I’ll assess the situation at Kennedy Meadows and make a decision. –Katoola Microspikes for the Sierra. 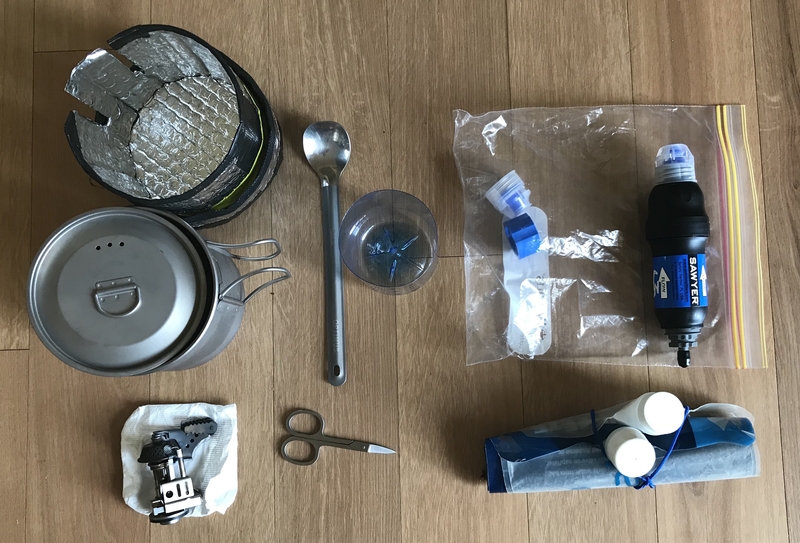 Not the lightest pack contents but a realistic weight for many hikers out there. 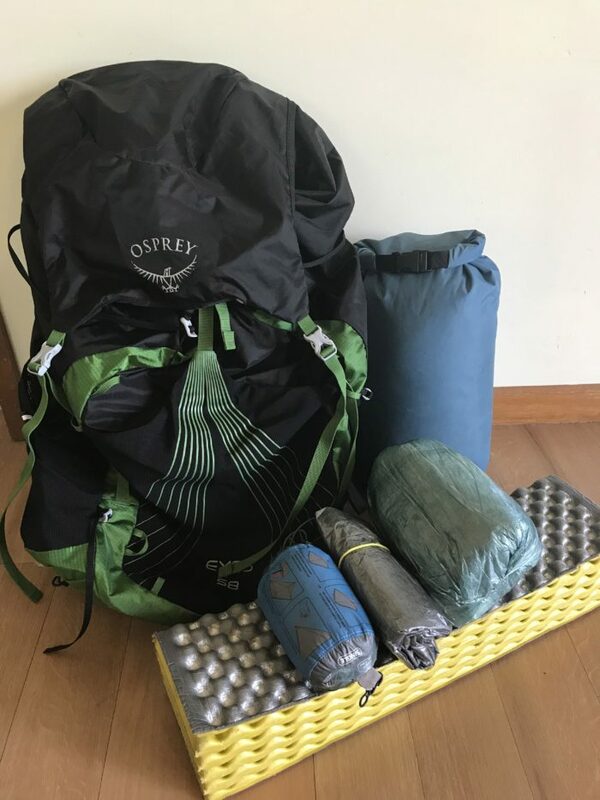 I do not know how hikers are claiming to have three-kilogram base weights. I just can’t get there. They say the biggest weight is from the fears that you pack but I’m pretty sure my fears do not weigh four kilograms. –No drying cloth for condensation and use a bandana, save 19g. –No pillow and use a stuff sack with clothes, save 59g. –Use only one pair of socks, not liners, save 20g. –Ditch the town clothes (shirt 148 g, shorts 80g), save 228g. –Use Opsack for food bag without Cuban Fiber bag, save 35g. 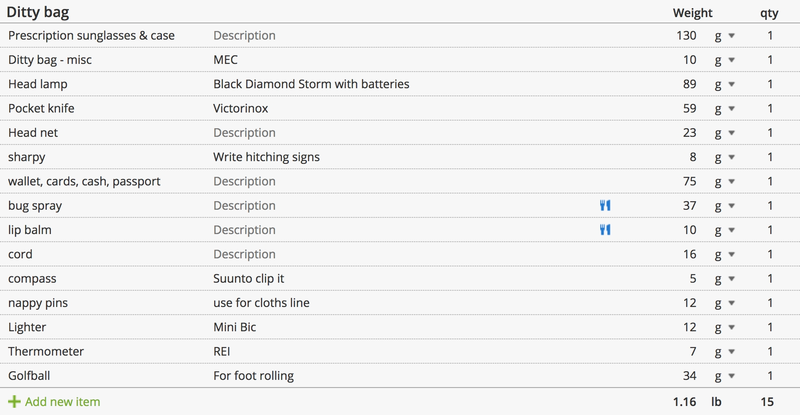 –Reduce electronics, use phone for videos not GoPro, save 163g. Love the list. Eerily similar to mine, starting with the brain-less Exos down to the Chromedome. Good luck out there!